The new virus was nicknamed MERS or Middle East respiratory syndrome. This virus is a coronavirus in the Coronavirinae family. It was discovered by an Egyptian named Dr. Ali Mohamed Zaki. This virus was previously unknown to the world before September 24th 2012. Dr. Ali Zaki extracted the previously unknown virus from a 60 year old patient that had acute pnueumonia and was suffering from an acute renal failure. This means that his kidneys shutdown and quit filtering contaminants in his blood. This is a very serious problem and most definitely life threatning. 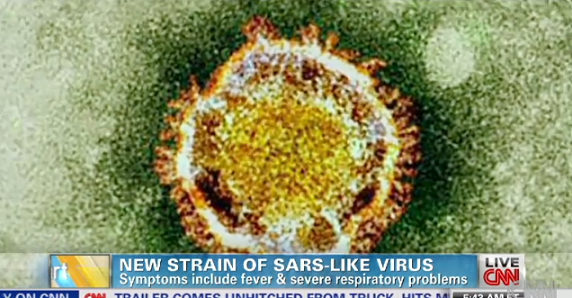 The MERS virus is much like SARS and belongs to the same 'coronavirus' family. After Dr. Ali Zaki was able to identify and test for this virus using a broad-spectrum testing method the UK Health Protection Agency or the HPA confirmed the virus in a 49 year old Qatari man who had recently been flown in to a UK hospital. This man died from an acute respiratory illness in London. The origin of this virus is still unknown. So far in the Middle East and Europe 51 people have been infected with this virus, and 31 of these people have died. That ratio is not good, we have no known cure, and no way of treating the people that do become infected. The worse part is we have no idea where this virus is coming from. If this disease becomes more widespread it could easily kill millions of people. As far as conspiracy theories go I can see them already popping up all over the Internet with 2 possible scenarios. The first being that the virus is completely man-made and does not actually exist. Why would they do such a thing? People are saying it is because they want to start getting people quarantined and placed into already existing FEMA camps. Just do some research and see all of the new FEMA facilities that have been created. What is FEMA planning for? What do they have inside knowledge of? The other big conspiracy floating around the Internet is that the virus DOES exist and it is completely man made with the purpose of lowering the world's population in a major way. Of course these theorists say that the global elite will have the antidote for private use. Lets look at the facts before we start siding with all of the conspiracies that are out there. First off the virus was initially found in the Middle East. After all, this is where all of the supposed 9/11 hijackers came from. Oh, you believe 9/11 was an inside job? Fine. Lets just say Muslim extremists then, after all they want all infidels dead right? I am sure they consider most of the world's populations infidels... Just something to think about. What do you think? Do you have a conspiracy theory about the new MERS virus? Do you think that the Bilderberg group is responsible or the Trilateral commission? This definitely seems like something to further Agenda 21. Ive recently done an article about Agenda 21 and you can read about it here. Let me know what you think in the comments.